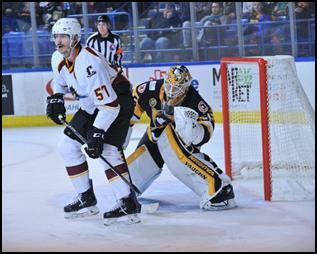 The Cleveland Monsters were defeated by the Wilkes-Barre/Scranton Penguins, 7-2, on Friday night at Mohegan Sun Arena at Casey Plaza. With the loss, the Monsters drop to 21-18-4-1 overall this season and with 47 points, remain alone in fifth place in the AHL’s North Division standings. The Penguins got the scoring started in the opening period when Joseph Blandisi netted an even-strength goal at 7:00 to give Wilkes-Barre/Scranton an early 1-0 lead. Moments later, Ethan Prow pushed the Penguins lead to 2-0 after a power-play goal at 9:26 of the first frame. The Pens went on to take a 3-0 lead into the first intermission courtesy of an even-strength goal from Jean-Sebastien Dea at 16:30. In the middle frame, the Monsters got on the board when Dan DeSalvo tallied a power-play goal at 12:16 on assists from Paul Bittner and Nathan Gerbe to trim Wilkes-Barre/Scranton’s lead to 3-1. The Penguins answered right back when Ryan Haggerty potted home an even-strength marker at 18:49 to extend the home team’s lead to 4-1 after two periods. Dea picked up his second goal of the game at 1:16 of the third period to give the Penguins a 5-1 lead. 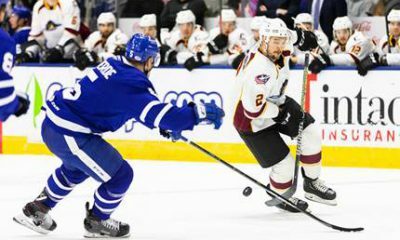 Cleveland responded back at 1:49 as Dillon Simpson tallied his first goal as a Monster, an even-strength goal with assists from Alex Broadhurst and Michael Prapavessis to make the score 5-2. Wilkes-Barre Scranton capped the scoring for the evening with two goals in the final frame, the first from Anthony Angello at 3:18 and the second from Sam Miletic at 13:15 to seal a 7-2 victory for the Penguins. 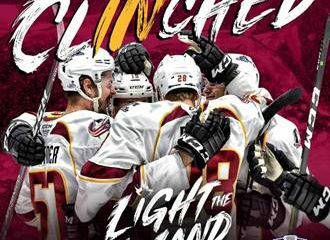 Cleveland goaltender Matiss Kivlenieks stopped 35 of the 42 shots he faced to drop to 4-3-1 on the season, while Penguins netminder Tristan Jarry stopped 31 of the 33 shots he faced to improve to 15-8-3 on the year. Next up for the Monsters, it’s a Saturday road matchup versus the Syracuse Crunch with full coverage, live from the The Oncenter War Memorial Arena, underway at 7:00 pm.